Olivier Giroud has lost some ground since Wenger gave Alexis Sanchez a more forward role this season. It's a shame because what he can offer to the team far outweighs the minutes he’s been getting on the pitch. The landscape looks differently for him this year with Wenger opting to use Sanchez at the apex of attack. And while this may be seen by some as a successful tactical move, which it is, others are left wondering whether Giroud deserves to be a bit-player. Apart from dry patches here and there, the French centre-forward has not failed to deliver goals when they were expected of him since his arrival from Monpellier in 2012. At one point, he served as Wenger’s only viable option up front. In each season so far he has managed around 15 goals–a statistic that hardly sets the world alight–but a deeper look reveals Giroud’s leeway for improvement. This graph shows both players’ performance stats in their last three seasons. There is no question that Sanchez gives more on the creative front. The number of goals both players score is nearly even: Sanchez is more accurate in his shooting but Giroud is more clinical. 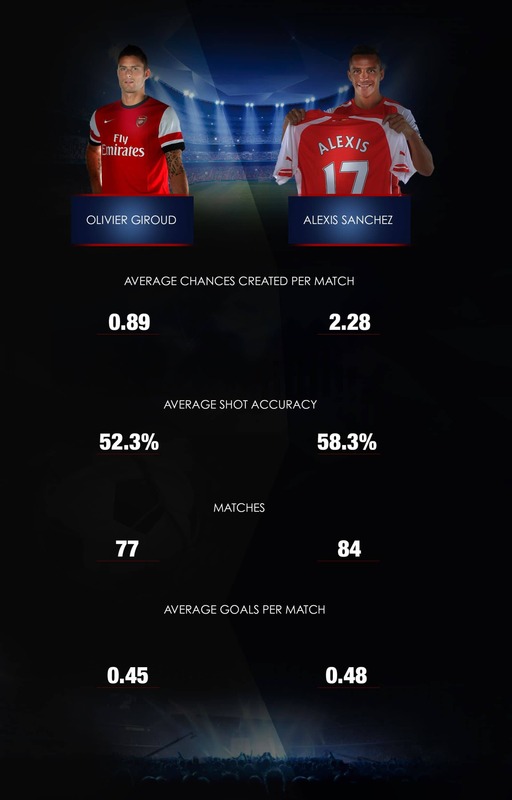 Most of the stats are acquired from the time when Sanchez played a deeper role from which he proved to possess an excellent goal-scoring sense. This is perhaps the main reason for Wenger to move him forward into the sole attacking position–to attempt to boost that sense even further. But the tender balance between the two players escapes Wenger. The French striker has many endearing football qualities. He is the team’s best header of the ball, by far, and possesses plenty of strength and vision to make him into a solid target man. Wenger cannot pull another rabbit like this from his magic hat. With Sanchez, Wenger gets speed and creativity, with Giroud, he adds a threatening edge from slower pieces of play. 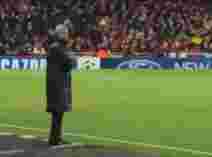 As it is, Wenger has made it into a choice between the two: two different tactical approaches. But it needn’t be like this. There are three options for Le Professor: change formation, drop Sanchez deeper on the pitch or bench Giroud. Asking Wenger for a change in formation to accommodate an individual player would be ‘pushing it’ as he has consistently shown favourism for team-oriented tactical solutions. Benching Giroud, or giving him bits of game time, as has been the case this season, has worked well so far with the French striker squeezing out six goals in 13 appearances. But what about the third option: Placing Giroud at the apex of attack, and Sanchez in a supporting role, either in a wide or central position? This would present a multi-layered attacking threat to oppositional teams and could provide Giroud with a more-than-decent creative support. The minutes Giroud would get out of this could boost his confidence as he has proven more than once to be a player whose form revolves around confidence. Could such solution add another five or 10 goals to the 15-goal-a-season repertoire of Giroud? Since the start of the season, Giroud has been getting 15-20 minutes a game at most, except for the last three games, against Watford, Crystal Palace and Bournemouth. But one wonders whether Wenger would lose any sleep over ‘what if’ after seeing Giroud score a wonder goal against Crystal Palace. In the context of Wenger having witnessed some amazing stuff with Dennis Bergkamp and Thierry Henry, it’s a compliment which Giroud would undoubtedly cherish. But will the French manager dig deeper in search for optimising solutions to Giroud’s form? The Bournemouth game hints that he may. One thing we have learnt since Giroud joined Arsenal is that there is a gap between being good and being extraordinary. For Giroud the bridge that could traverse that gap seems to lay in Arsene Wenger’s tactics.